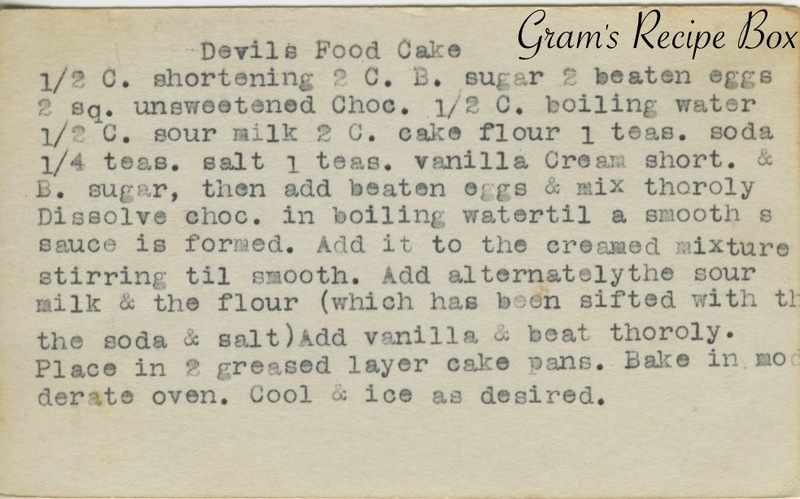 I’m going to have to create a category just for the different Devil’s Food Cake recipes. Would this help anyone? I think I have five now and since it is popular, that number will likely grow. Here we have Devils (no apostrophe) Food Cake and it looks to be a “traditional” devil’s food, using melted chocolate, bakings soda for lift and beaten eggs for airiness. 1/2 c shortening, 2 c b. sugar, 2 beaten eggs, 2 sqa unsweetened choc., 1/2 c boiling water, 1/2 sour milk, 2 c cake flour, 1 teas soda, 1/4 teas salt, 1 teas vanilla. Cream short. & b. sugar, then add beaten eggs & mix thoroly. Dissolve choc. in boiling water til a smooth sauce is formed. Add it to the creamed mixture stirring tip smooth. Add alternately the sour milk & the flour (which has been sifted with the soda & salt). Add vanilla & beat thoroly. Place in 2 greased layer cake pans. Bake in moderate oven. Cool & ice as desired.